In his remarkable account of the widespread doping which has been the norm for Tour de France cyclists, Tyler Hamilton has finally come clean. For many years he and former colleague Lance Armstrong strenuously denied all accusations. In Hamilton's case even when directly asked by his parents if he was doping. He even allowed his parents to support a campaign to clear his name when he knew that he was guilty. 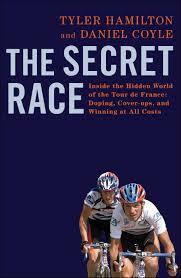 The whole sorry tale is told in considerable detail in The Secret Race, a book that contributed largely to Lance Armstrong's downfall. Armstrong, like Hamilton, had denied wrong doing for many years. But as the evidence accumulated against him, he finally conceded defeat. His interview with Oprah is almost painful to watch, although it's hard to feel any sympathy for him. He'd mislead so many people for so long and brazenly supported anti-doping campaigns, when he was indulging all the time. I really don't know if Dave Lee Travis is innocent of the charges against him and which he strenuously denies. I sincerly hope so. But I do know that denial of wrong doing is all too easy and no guarantee of truth telling. Blame shifting is innate and is first recorded of Adam and Eve when confronted with their disobedience towards their loving Creator. What is so disturbing about Hamilton's book is just how long such deceit can continue, despite leaving the person ever more trapped in the web of lies needed. It's salutary and a reminder of how powerful sin is. Attractive it inevitably is at first, but once drawn in, we find ourselves no longer free agents but are at the mercy of a force seemingly beyond our control.